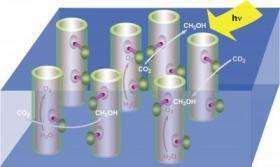 (PhysOrg.com) -- For millions of years, green plants have employed photosynthesis to capture energy from sunlight and convert it into electrochemical energy. A goal of scientists has been to develop an artificial version of photosynthesis that can be used to produce liquid fuels from carbon dioxide and water. Researchers with the U.S. Department of Energy's Lawrence Berkeley National Laboratory (Berkeley Lab) have now taken a critical step towards this goal with the discovery that nano-sized crystals of cobalt oxide can effectively carry out the critical photosynthetic reaction of splitting water molecules. In this video, an aqueous solution contains silica particles that have been embedded with photooxidizing cobalt oxide nanocrystals plus a sensitizer to allow the water-splitting reaction to be driven by visible light. When laser light hits the solution it turns from gold to blue as the sensitizer absorbs light. Bubbles soon begin to form as oxygen gas is released from the spilt water molecules. Artificial photosynthesis for the production of liquid fuels offers the promise of a renewable and carbon-neutral source of transportation energy, meaning it would not contribute to the global warming that results from the burning of oil and coal. The idea is to improve upon the process that has long-served green plants and certain bacteria by integrating into a single platform light-harvesting systems that can capture solar photons and catalytic systems that can oxidize water - in other words, an artificial leaf. "To take advantage of the flexibility and precision by which light absorption, charge transport and catalytic properties can be controlled by discrete inorganic molecular structures, we have been working with polynuclear metal oxide nanoclusters in silica," Frei said. "In earlier work, we found that iridium oxide was efficient and fast enough to do the job, but iridium is the least abundant metal on earth and not suitable for use on a very large scale. We needed a metal that was equally effective but far more abundant." This research looks incredibly promising. Glad to see research on solar energy being done beyond improving photovoltaic cell efficiency. Turning water into oxygen and hydrogen, especially using just sunlight, is obviously a very important tech for humanity's future, and making it cheap is the obvious next step as we've been able to do it for some time. Very exciting stuff!